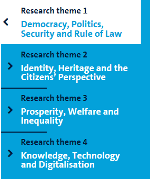 Maastricht University has launched the "Maastricht, Working on Europe" research agenda. UM heeds the urgent need to renew and expand UMs research agenda on European integration, the EU and Europe more generally; and to do this through innovative multi-disciplinary research collaborations. The research agenda is now online as well as the first calls for Postdocs (particularly themes 3 and 4 are of interest for CAPHRI). Dr. Peter Schröder-Back (VHC) is one of the members of the Academic Board implementing the Maastricht, Working on Europe research calls. Postdoctoral researcher Knowledge, Technology and Digitalisation (0.8-1.0 fte). Please apply for these positions before 9 November 2018.